I've got the ethics, the family values, a passport and, like the Alaska governor, am perfectly aligned with God's will. Like the Governor, I now also believe that my will is perfectly aligned with God’s will. When Governor Palin said that it was God’s will for the Alaska pipeline to be built and asked for people to pray for that to happen, I was really inspired by her confidence in the absolute, seamless integration of her will and God’s will. I have begun practicing this kind of supreme confidence on a smaller scale, but I am sure that I can quickly move to national issues. Starting with the sartorial, I know that it is God’s will that I have the entire Chanel collection for the fall season, including those adorable high-heeled booties that were all over the runway shows. Along with Governor Palin, I don’t believe that humans cause climate change. Here’s where I really shine. Governor Palin got her first passport in 2007. I got my first passport in 1970, when the Governor was only 6 years old! Not only do I have a passport, I have actually been outside of the United States, dozens of times. I have had relationships and conversations with real foreigners, in their own countries, in restaurants, shops, flea markets, museums, nightclubs, spas, hotels, all modes of public transportation, and even in their own homes. My foreign policies are fair, inclusive and sensitive to cultural differences. I don’t ask for English Breakfast tea when I’m in France. I never call foreign currency “funny money” (even though it does look funny.) I don’t shout at people to help them better understand English and, finally, I act on God’s will when in Paris by going to Chanel, and to all the great boutiques, which is just an extension of God’s will, as you can surely extrapolate by the above explanation of my will/God’s will. I know Governor Palin has one distinct advantage in living so close to Russia, in that she can keep a close eye on nefarious activity across the Bering Strait, but I, too, live very close to a foreign country. Canada is less than 400 miles from my home in New York City, and you never know when it might become necessary to invade a sovereign nation that has not attacked us, as we learned the hard way. Not only that, I have a girlfriend in Austin, Texas, whom I’m going to ask to keep an eye on Mexico. Governor Palin went to five different colleges to get her BS in journalism, but none of the colleges had entry requirements, whereas I went to a university that required a trigonometry credit before they would admit me. I had to take it the summer before school started. I don’t remember a frigging thing, but I got a B. The other disparities in education are too numerous to mention, but suffice to say that I bet she never met Lee Strasberg. It is true that I have no background in constitutional law, but I have read the Constitution, except for the amendments that don’t have anything to do with me, and I watched the entire John Adams mini-series on HBO. Twice. I really think this whole investigation into the firing of the top state law enforcement official in Alaska, who wouldn’t fire the state trooper who was mean to the Governor’s sister, is just overblown. I once fired my assistant for making a pass at my husband, so I can totally understand this! And I would have fired an assistant who made a pass at my sister’s husband, too. I love my sisters. Governor Palin loves her sister. People need to get over it. But speaking of family, I’ve also had my fill of no-good boyfriends to my daughters, and boy, do I sympathize with the Governor over this Levi fellow and his MySpace page, with the guns and the cursing. My husband once took a broken chair out into the street to chase away a no-good boyfriend of my oldest daughter, and we didn’t see the likes of him anymore. I have a zero-tolerance policy for miscreant youth, and I know I could help the Governor sort out her obviously conflicted feelings about setting limits for teenagers, just for her own peace of mind. Governor Palin was the mayor of a real town of 5,000 people. I have never been mayor of anything, but I have performed for crowds bigger than the population of Wasilla, Alaska, and I can tell you it’s no picnic getting the monitors just right, working with cranky and egotistical musicians, changing clothes in dirty dressing rooms and eating bad backstage food, handling the hecklers and technical problems during a show, and then getting on the bus to go somewhere else and do it all over again the next night. Also, my last record sold about the population of Wasilla times forty, and they all seemed to like it. But dealing with the public is really difficult and they all have opinions about you, which are usually all wrong, so I’ve developed a thick skin, another requirement for life as the VP. Lastly, and the importance of this cannot be over-emphasized, the guy’s head on the tail of the Alaska Airlines planes looks like my dad. Finally, there is one subject in which I find I am even more conservative than the Governor, and that is in the area of neo-natal responsibility. The Governor was eight months pregnant and in Texas to give a speech, when her water broke. She reportedly made her speech and then traveled eleven hours, dripping amniotic fluid, bypassing Seattle and Anchorage (major cities with world-class hospitals) to travel to a small hospital in Wasilla that had no neo-natal intensive care unit, and gave birth there. Call me a wimp, call me insecure, but you had better also call me a maverick, because I would have said “Damn the schedule! Damn the speech and the airline ticket!” If this had been me, as soon as my water broke, I’d be at the closest hospital and that baby would have been born in Texas! Just like my mom! In summation, I present myself to the GOP as a woman, and I repeat, woman, who has held a passport for thirty-eight years, a lip gloss-wearing soccer-volleyball-softball-gymnastics mom of five, who can carry a six-pack home to her husband like nobody’s business, whose will is firmly aligned with God’s will, a neo-natal conservative and legally savvy public figure, a border-watching, trigonometry-credited, breastfeeding, BlackBerry-tapping, cat-throwing maverick whose daughters are out of their teens, therefore immune to teenage pregnancy (although this is a private, family matter), and whose dad’s head (or an eerie facsimile) adorns a state airline. I could offer more to recommend me to the job of vice president, but one last special quality that I share with Governor Palin is the fact that I also have a husband who wants his state to secede from the Union. Ever since the 2000 election, my husband has been all for the secession of not only New York, but the island of Manhattan! And I have to tell you, if Sarah Palin becomes vice president of the United States, he says we have to personally secede from the whole country. So please, people, write me in on the ballot in November, or write me in New Zealand, where I’ll be making my new home. Rosanne Cash is a singer-songwriter, and even though she has met Presidents Bush and Clinton (who appeared to note her décolletage with great appreciation), the ambassador to the Czech Republic and George Stevens, who produces the Kennedy Center Honors awards show, she does not think her knowledge of world leaders should be held against her, because her experience in Washington is limited to three days during the Million Mom March. 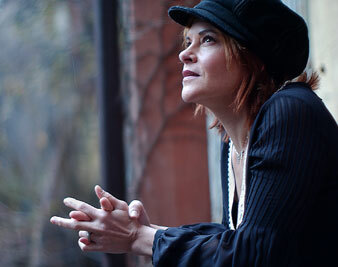 Rosanne CashRosanne Cash is a Grammy-winning singer and songwriter. Her fourteen record albums, released over the past twenty-five years, have charted eleven number-one singles. She has earned numerous accolades for songwriting and performance.